This is a Webflow lightbox with a video link. 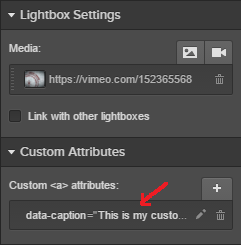 Notice that Webflow doesn't support captions for video/media embed in a lightbox. This is the same lightbox as above, but with caption displayed below. Add a custom attribute to the lightbox settings tab. For name field type "data-caption". In the value field, provide your caption. We will now bring the caption below the video, by adding an extra style. Paste this after the code above. The above code will apply to all lightboxes on the page. To apply this to the whole project, instead of pasting the code in the page settings, you can paste this in the site dashboard "Custom Code (before </body> tag)" field. Discuss or ask any questions on the forum at http://forum.webflow.com/t/23628.